Superhero movies are quite special, in a way that they are quite larger than life. Flashy costumes, intense action and cool villains. The quintessential superhero movie has it all. And let's not forget the superheroes with their super powers. There is one piece though, that's essential to complete the frame of any superhero movie, and that is a supercar. The upcoming superhero movie, Justice League promises to be one such , out of this word movie. What has caught the attention of automobile enthusiasts, however, are two Mercedes-Benz cars- The E-Class Cabriolet and the vision Gran Turismo. Two special cars that are sure to grab as much attention as the characters in the movie. The E-Class Cabriolet was the only such piece in existence, when the film was being shot, which made it very special. The car, in the movie, is driven by Wonder Woman, played by Gal Gadot. The other car that's got us excited is the Mercedes-Benz Vision Gran Turismo. Created originally to feature in the Gran Turismo game, the Vision GT was brought to life by a set of dedicated engineers who also designed a radical interior for a car that, in essence, only existed in the virtual world. The video will take you behind the scenes and give you a peek into how the Vision GT was brought to life. The car is driven by Batman played by Ben Affleck. 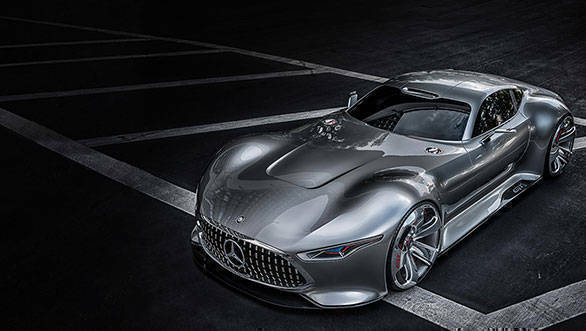 The Mercedes-Benz Vision Gran Turismo surely looks like a car befitting the character of Batman.